Illumination #1 was revived in Old Town in 2014 as part of the Illuminations Series of the Old Town History Project, a community-based history, art and culture organization devoted to the preservation and revitalization of Portland’s oldest surviving historic district. 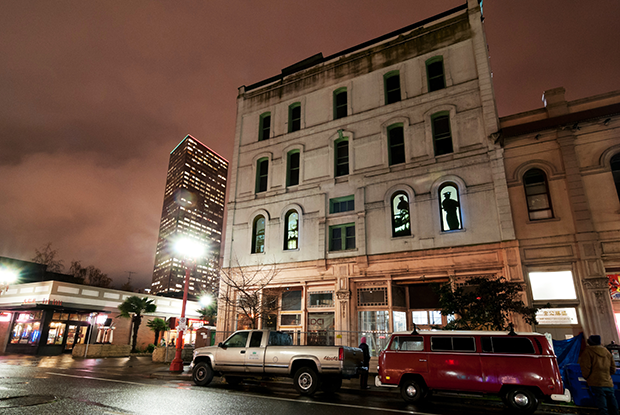 Projected through the windows of the original Portland Seamen’s Bethel Building at NW Third and Davis, the installation explores 120 years of Portland’s cultural history in a twelve-minute loop. The project comes at a time when a number of historic structures in Portland’s Old Town are in the midst of redevelopment. Bond’s work will use the windows of the Mariner’s Hotel Building as screens for still and moving images that use specific gestures, story fragments and names to explore the identities of the Chinese, Japanese, Jewish, Roma and other residents of Old Town/Chinatown as well as the accretions of memory held and reflected by the building. The 1881 landmark building itself is being fully restored as The Society Hotel, opening in 2015.